What to do with those readings that stump ya? A lot of people have a lot of good techniques that don’t include reshuffling (drawing clarity cards, looking for images, etc.) For me, if I’m REALLY stumped, I get as literal as possible with the image. The other day I did a career reading and in the “best course of action” slot I got…the Eight of Swords. Well crap. That doesn’t really make a lot of sense at first glance. I didn’t really know what to tell the querent. ‘Uhhh…you should…not…feel trapped?’ That’s not really a course of action, is it? I took a harder look at the card. 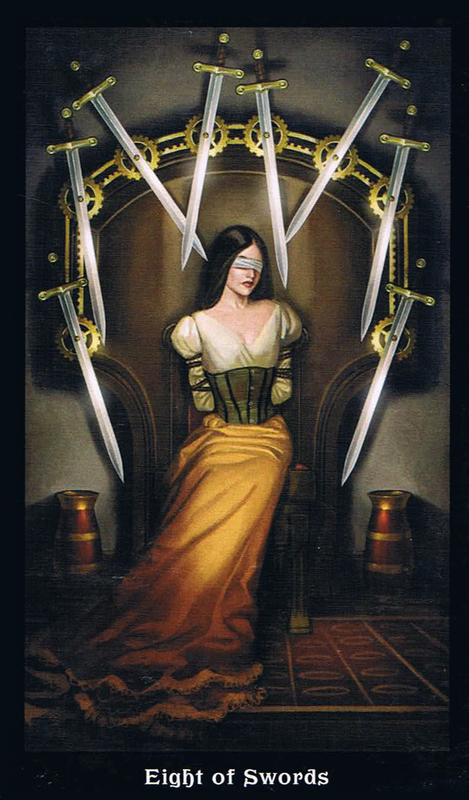 It depicts a woman sitting in a chair, surrounded by swords, wearing a blindfold. I studied the image VERY carefully until I realized that, quite frankly, if this woman just stood up out of the chair and walked in a straight line, she’d probably be fine. I told the querent to think of the most obvious solution to their problem. They came up with one pretty quickly, and of course, a million reasons why that plan wasn’t a good idea (thus why they hadn’t already tried it). I listened and realized their FIRST solution was honestly probably a good one. We talked a bit about it, and they had a lot of clarity about how viable that “easy” solution was. Sometimes, when Tarot stumps me, I figure it’s the cards giving me a wake up call: “you’re overthinking this, jerk.” This is an image based system – LOOK AT THE CARD, DOOFUS. The cards have their traditional meanings, but when worse comes to worse, maybe the system wants you to go back to Kindergarten and read pictures.